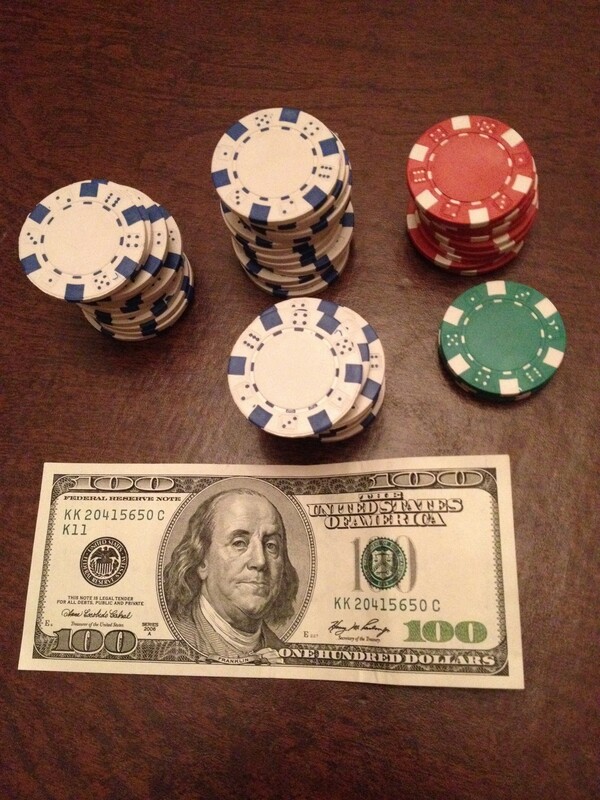 Once upon a time, I learned how to play Texas Holdem. And by once upon a time I mean like three days ago. My dad’s brothers and their families have been in town this week and we’ve been playing cards every night. Last night we played for money. I wish this story would end with me winning the money and riding off into the sunset on my noble steed to go buy white high tops because that’s one of the few pairs of Converse I don’t own. You can never have enough Converse. I would know because I may or may not have 14 pairs. Unfortunately that’s not quite how the story goes. Everyone was out of the game and it was just down to my mom and yours truly. Thank goodness neither of us are very competitive. Hahahahahahahaha. Right. I think she was on the verge of disinheriting me a few times and might have threatened to kick me out of the house. I smiled politely/sinisterly and proceeded to win. The game dragged on until almost 1am, but I finally won. I held the money in my hands for a glorious seven seconds until my mom snatched it from me and reminded me that I owed her 100 bucks. Fifty for the money I got when I sold my biology textbook back and fifty that I was charged by my school because I didn’t have my room ready for a new roommate to move in because my original roommate left me months ago. But that’s another story. My siblings Sister Celiac, Future Chef, Evil Scientist, Brute, Corrupted Brother, and Spiderbaby, my parents, and I (Jeez, there are a lot of us…) just wanted to wish you a very merry Christmas. We hope your day is filled with much happiness and food and love and food and food. Also, Evil Scientist wanted me to tell you all that -40 degrees is the same in fahrenheit and celsius. And the part of your eye that allows you to see in 3D can see 1/10 of a second into the future. This kid is 9 and he’s already plotting to take over the world. Watch out. A picture is worth a thousand words. Also known as I’m too lazy to write today. 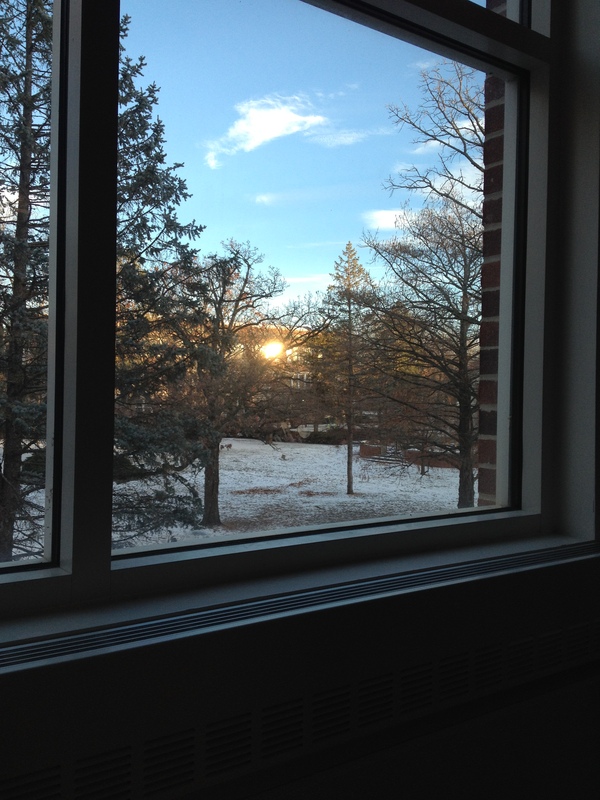 My current view from the library. 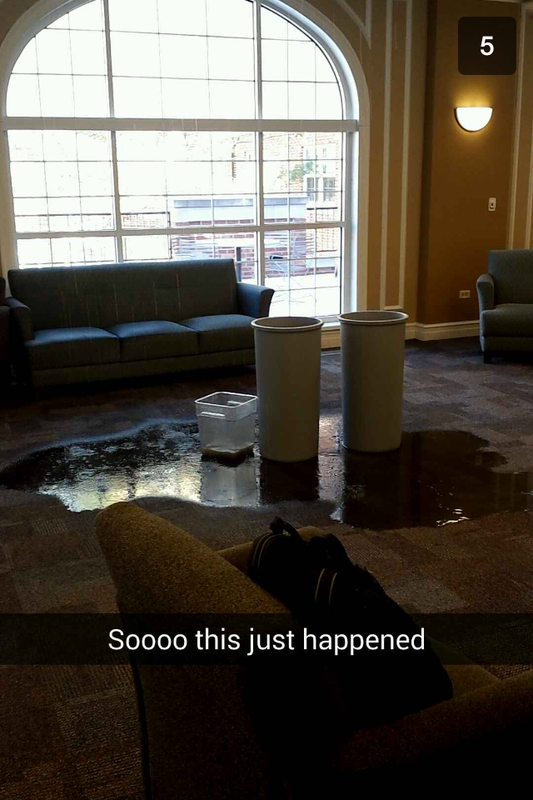 A pipe burst this afternoon in the main lounge of my dorm. I was sitting right there for a good six hours yesterday. I could have been doused in water and melted like the wicked witch of the west. Talk about a bad day. For our final for the nursing class we had to write a paragraph describing a nurse. That’s it. 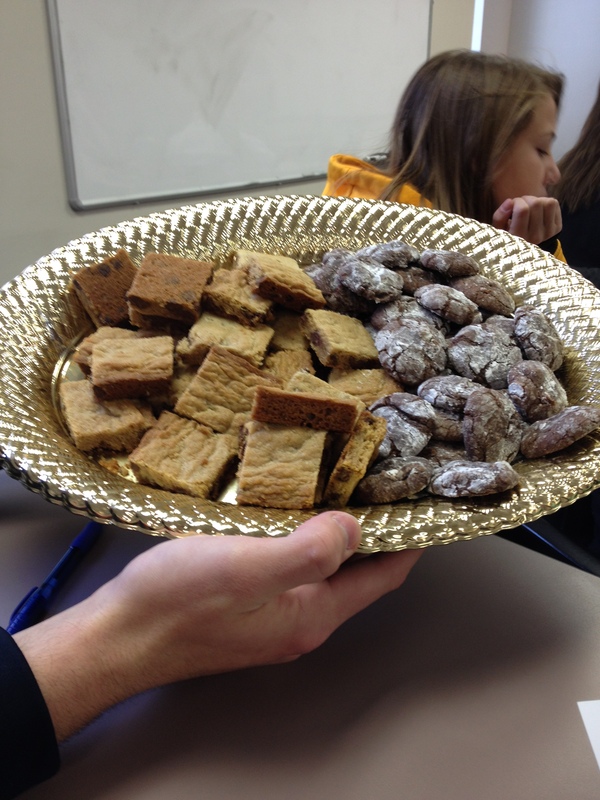 Everyone in the class has an A and the professor also gave us cookies. The guy holding that has diabetes and it worries me whenever he eats food because when he took his blood sugar today it was 212. Hey, I was just curious and he’s right there. I had to look. He’s also one of three guys in the class, which I think is really cool. 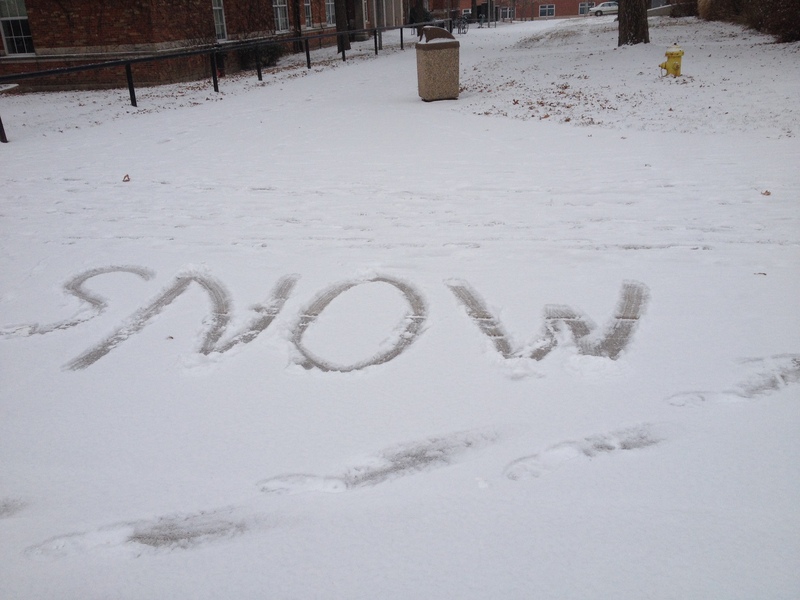 People are very excited about the snow here. I took this on my way to church Sunday. It’s still pretty snowy here and the snow isn’t too muddy and disgusting yet. A few nights ago I obviously was at the library too late because I was one of maybe 5 people left there. 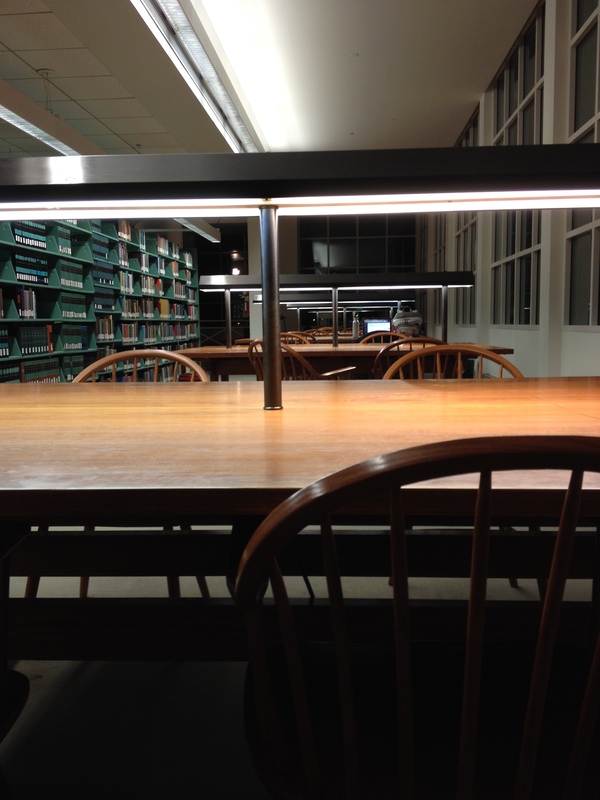 I’m trying to show you as many pictures as possible from the library to make it seem like I study a lot. Is it working? This is one of my best guys friends here. I was going to the cafe and he wanted to come too wearing that. Before we left he said hold on, I need to change. His idea of changing is putting on that jacket. 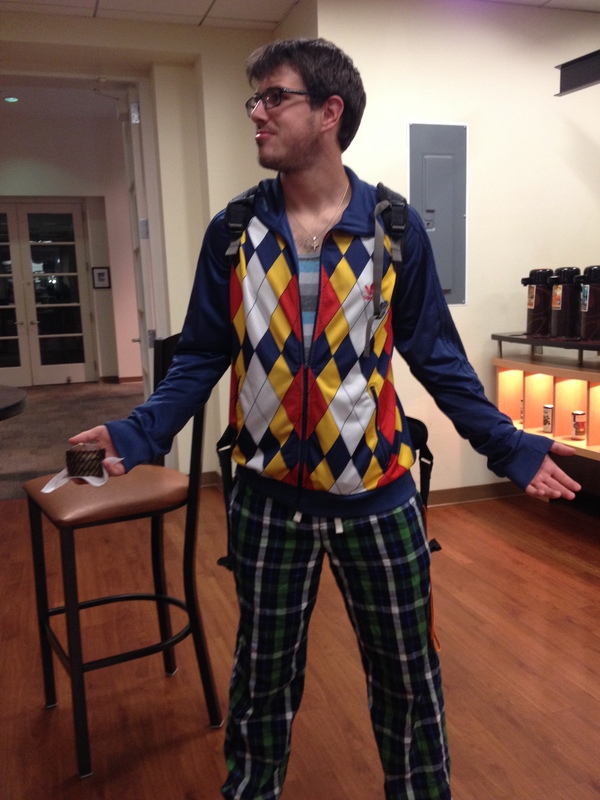 I swear he’s usually much cooler than this… sort of? 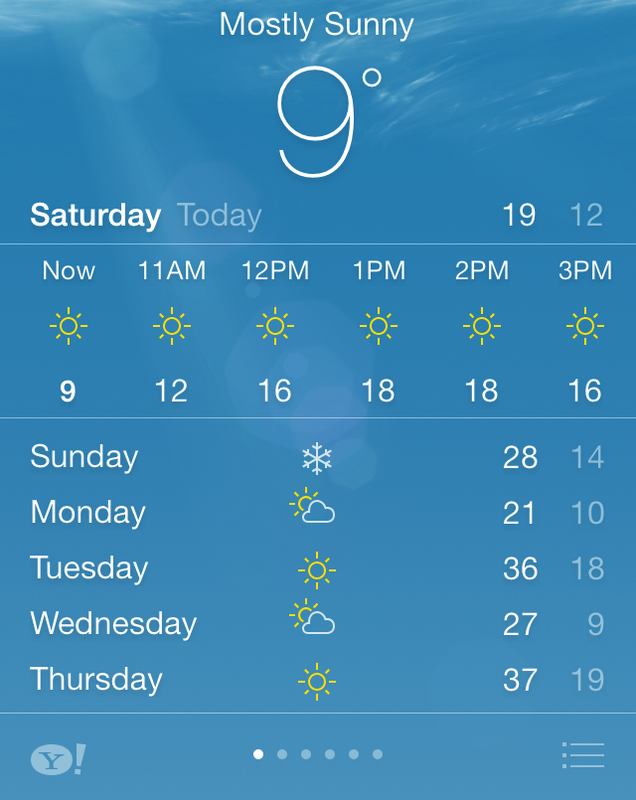 “Mostly sunny” reminds me of “mostly dead” which is how most of us feel all the time. This is from a few days ago and it didn’t even get up to 36 today. The wind chill last night was 0. 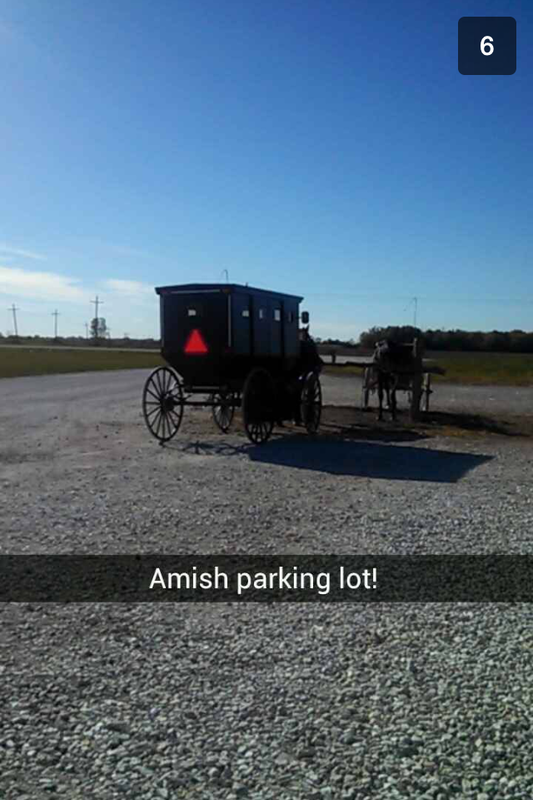 There are so many Amish people here. I don’t even know why. You know what would be cool? If we were all born with infused knowledge. Like we were super smart and wouldn’t have to learn ever. It would also be really cool if there were Dr. Pepper and McChicken trees. I’ve been studying like there’s no tomorrow and I’m a little exhausted. I was in the library with some friends for seven hours yesterday and I fell asleep on one of the couches. So, of course, one of the girls I was with took a snapchat of me and sent it to everyone on my floor. That’s what friends are for. That being said, I need a break from memorizing the differences between divergent and convergent evolution and thought I’d share with you some things that I’ve heard around campus lately. Ready? Brace yourself. I go to school with some serious weirdos. “If I may venture to say, I’d definitely go abroad to buy a kilo of that sort of meth just to sell it back in America. Although I hear that that particular kind destroys your axons and serotonin.” -My friend and I were at breakfast and there was an intense conversation about meth in the booth next to us between what had to be two chemistry majors. It’s so hard to laugh quietly when you’re half asleep anyway. “…I don’t get it.”-I went to see the men’s a capella group perform and they put on white shirts to sing White Christmas. Apparently not everyone caught on. “This place is so dirty. Oh well. You kids are paying thousands of dollars and that lets me have a job. Sometimes it gets frustrating, but that’s part of the job law.” – I was at the library attempting to study last night and some poor student had to be berated for a good twenty minutes by one of the ladies cleaning the library. She complained about her job for half of those. Also, does anyone know what a job law is…? “I think it should be a law that everyone has to play Animal Crossing. I think that would bring about world peace. Yeah.” -two guys studying next to me who were way too old to be playing video games. Where am I going to college.